And a Virgin Shall Lead Them. Transforming the mundane into the magnetic. MindBlown Labs is excited to announce our new Food for Innovative Thought Series. The goal of this series is to inspire leaders within the retirement industry, and the financial services industry more broadly, to expand their vision of what is possible. During this series, we will share insights from our own work. We will also highlight bold, creative and outlandish efforts undertaken by other organizations—throughout and beyond the financial services industry. While many of the entries in this series will focus on gamification, there will be many more that do not. We believe in the power of games and gamification, but we’re even bigger fans of great customer experiences, regardless of the medium or the industry. Enjoy! I hate sitting on planes before takeoff. Things always start so well before they turn sour: I get comfortable in my seat, pull up a book on my kindle, and start playing some tunes through my headphones to drown out restless babies and rumbling engines. Then, just as I’m settled for the journey ahead, the loudspeaker sounds over my music, the in-flight entertainment pauses, and everyone on the plane is forced to listen to a flight attendant explain how a seatbelt works. I already know how a seatbelt works. With a quick look, I can see that everyone around me already has their seatbelt fastened. We’re obviously all fans of safety. We’re not fans of really boring lectures about how to be safe. Airlines don’t want to annoy their passengers, but they don’t have a lot of wiggle room here—FAA regulations pretty strictly define what passengers have to be told before every flight. There’s no way for an airline to cut the safety speech or even shorten it much. Perhaps this situation is familiar to some of you. This is what makes Virgin America’s design-centered approach to turning this annoying experience into one that passengers actually look forward to so impressive. They completely reimagined the safety briefing process, transforming it into one of their most valuable marketing assets. The video was so well received that it’s been viewed over 12 million times online. C’mon. Who voluntarily watches flight safety instructions in their free time? Millions of people. When it’s done right. 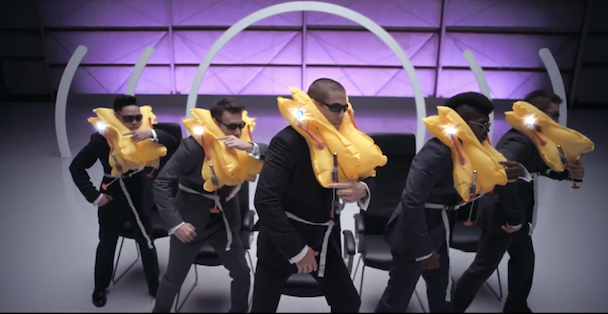 The Virgin America Safety video is below. If you haven’t seen it, we strongly recommend you watch it. This is an excellent example of what great design can accomplish, particularly when faced with significant constraints. The process of design isn’t afraid of constraints—in fact, the process of design is about solving a problem within constraints! By using constraints as a framework for compelling experiences, intentional design becomes a powerfully effective communication tool. Virgin America’s choices may seem simple in retrospect, but they were carefully considered. Why did they turn the safety speech into a musical number? Well, remember that music has been used to effectively communicate through entertainment throughout the history of humankind. Long before oral histories and stories like the Iliad and Odyssey were written down, they were sung. Much more recently, music was added to advertisements (which is another thing people collectively dislike sitting through repeatedly.) Simple jingles turned annoying interruptions into an experience listeners and watchers could participate in. The best part, from the advertiser’s perspective, the music not only eases the pain caused by a commercial but also increases retention of the message. After all, the more methods you use to communicate a point at once, the more your point will be remembered. Another key element to this safety video’s stickiness is the fact that it’s a true product of popular culture. The lyrics were created by American Idol star and YouTube sensation, Todrick Hall. The video features 10 “So You Think You Can Dance” alumni and the entire production was envisioned by award-winning director, Jon Chu, of the highly-popular dance movies “Step Up.” Virgin America leveraged the popularity and creative sensibilities of these individuals and empowered them to create something that fit seamlessly into a larger context but stayed within the bounds of the FAA’s regulations. Instead of trying to mimic what was cool and trendy, Virgin enlisted pop-culture personas to do what they do best– authentically create content experiences that people want to play and repeat. Whether you’re watching a movie, playing a game, or eating a nice meal, pacing is critical to maintaining the interest of participants. By using a variety of creative tools over the course of their video, Virgin America’s team maximized both information retention and entertainment. The safety musical number features musical and visual styles that vary to accompany shifts in topic. Tempo and rhythm change regularly to grab attention. The tone shifts from enthusiastic to self-mocking (watch how often the performers’ lip-syncing is referenced) to sincere. These shifts happen naturally and regularly as part of the music number’s intentionally crafted pacing. The muted grays of the cast’s wardrobe and the abstracted set leave plenty of room for visual gags, synchronized dance, and even explicit diagrams of exit rows—the video has a plan to draw the viewer’s eye in each frame. The visual style also deliberately leaves room for judicious splashes of color, and Virgin America’s signature purple and red frame highlight scenes much like they highlight Virgin America’s actual airplane interiors. The design decisions here aren’t only used to entertainingly re-teach seat belts, though. 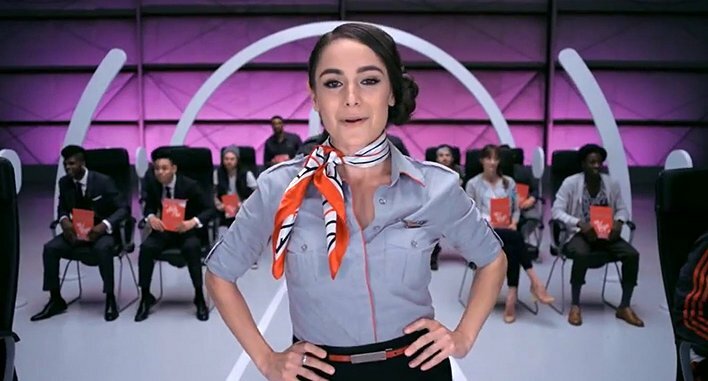 Virgin America also took the opportunity to infuse their whole safety video with their identity and values, with a diverse cast that relates to the diverse body of passengers, and self-referential humor that assures viewers that while safety might be a serious matter, flying doesn’t have to be. We at MindBlown Labs wanted to call out this excellent example of a poor customer experience turned positive because we believe the world is full of opportunities for improvement. With the careful use of design principles, we all can work to take experiences that annoy, confuse or anger, and present them in new, compelling ways that excite and increase brand loyalty. Next time you’re thinking about any type of participant communications (e.g., emails, workshops, marketing materials), we invite you to consider just how much more compelling, engaging and motivating you can make these experiences. A little bit of design thinking goes a long way. Great design (i.e., creativity bounded but undiminished by constraints) is the key to improving just about any aspect of your customer experience. By incorporating music, popular culture, rich visuals and pacing effectively, you can make even a terrible experience engaging. In 2017, great design has become much more commonplace and is increasingly demanded by all end-users, particularly those of the Millennial persuasion. Designing and creating rich customer experiences sometimes take significant upfront investment. Organizations who make these investments will distinguish themselves from the competition.